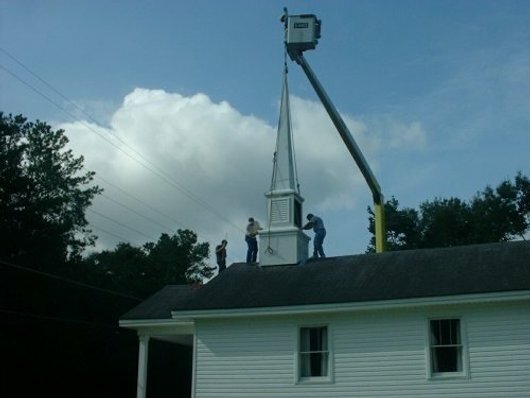 I’ve posted an album of pre-Katrina pictures of Lakeshore baptist Church on our Rebuild Lakeshore Facebook page. For the past three years you have faithfully, generously, and selflessly come to the assistance of those in our community as we rebuild in the catastrophic wake of Hurricane Katrina. By God’s grace you have assisted in making huge strides toward recovery. 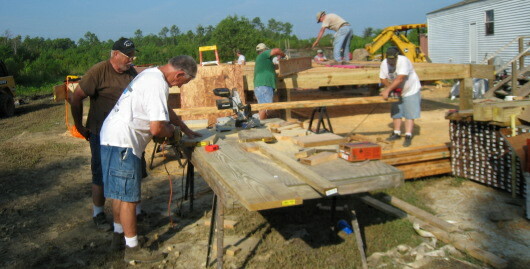 With your help we have been a part of rehabbing a few hundred homes. 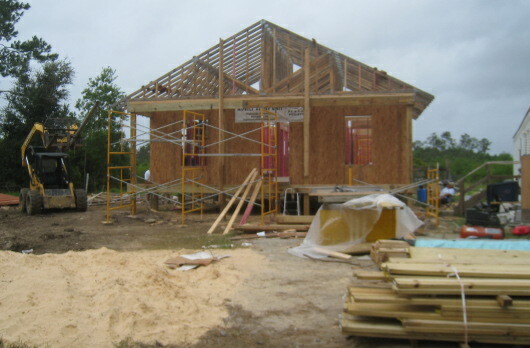 In the last couple of weeks we began constructing our 31st house from the ground up. The distribution center has ministered to literally thousands of residence with necessary food, clothing, and household items as locals put their lives back together. Roughly 450 churches have partnered with us in mission trips to our area and we can not thank God enough for your contribution to the efforts. While we have seen so much progress, we see a long road ahead with several thousand residence still living in temporary housing. We plan to continue the Rebuild Lakeshore efforts for the for seeable future. The three year anniversary of Katrina had us evacuating the gulf coast once again. 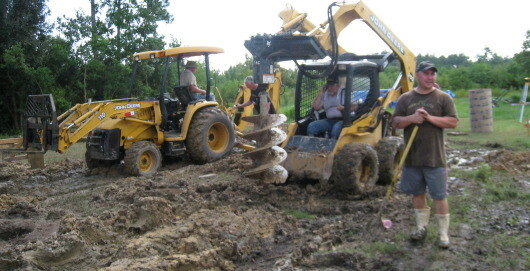 In the providence of God, Hurricane Gustav left little damage to our area compared to Katrina’s monster foot print. All the homes that volunteers have constructed held up without damage, however many campers, trailers and cottages took on water. 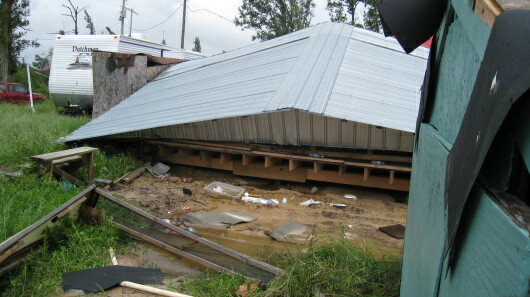 On our church property, the metal church building and the office escaped unscathed by Gustav. 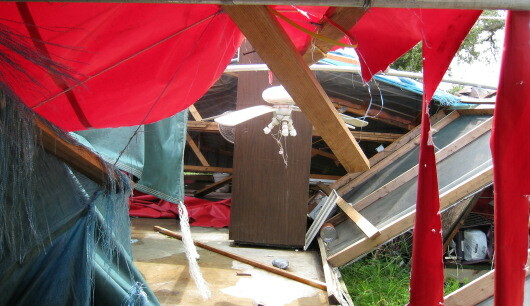 Even most of our small sheds held up under the strong winds. 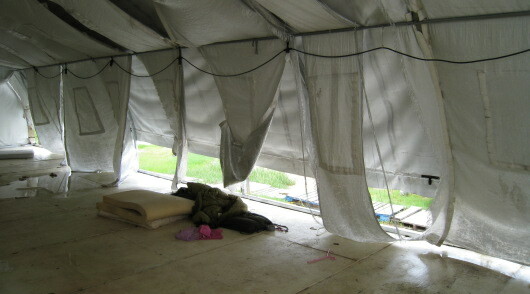 The big white storage tent did not fair as well and we lost some of our building supplies. A few trees fell and limbs littered the property. The camp kitchen suffered the most damage. In our evacuation efforts we were able to pull most of the kitchen equipment out and bring it to higher ground, however the dining hall structure completely collapsed. 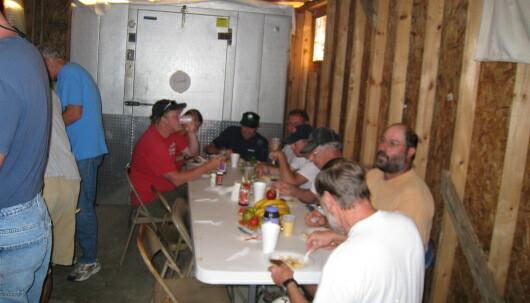 This loss leaves us nowhere to feed the flood of volunteers needed to continue the recovery efforts. We need to reconstruct a kitchen facility as soon as possible. Our post-katrina Kitchen went up out of necessity without regard to long term durability. This time we want to build a more stable structure that can survive strong winds and light flooding. We already have plans on the drawing board, but we need your help to fund this special project. We have set up a Facebook cause, “Rebuild Lakeshore’s Kitchen,” where we can accept online donations. If you prefer to use traditional mail, make checks payable to “Lakeshore Baptist Church” with “Camp Kitchen” in the memo line. 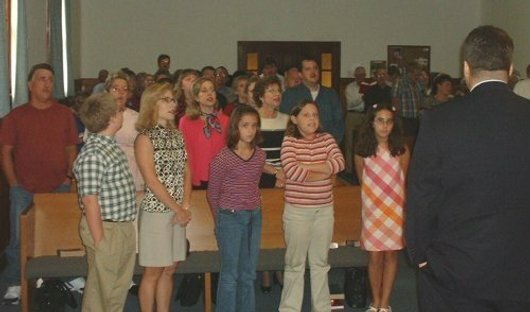 Mail to: Lakeshore Baptist Church PO Box 293 Lakeshore MS 39558. Your tax deductible donations will enable us to host mission teams and minister the love of Christ to our community for years to come. We can not thank you enough. The damage from Hurricane Gustav presented just a minor glitch in the overall productivity of the rebuilding efforts here in Lakeshore. Although meal preparation and dining have been cramped, and some projects got shifted around in priority, we continue to move forward full steam ahead. 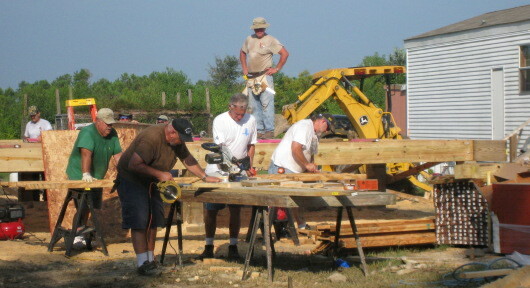 In the past week and a half, folks from Highlands Fellowship, Abingdon VA, set the pilings and framed another new construction home. 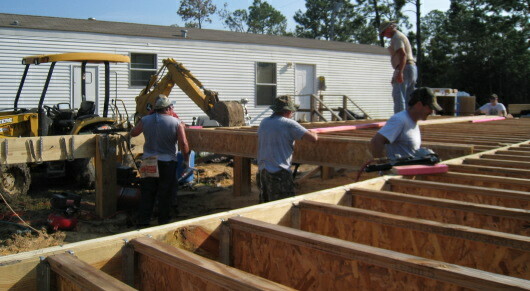 Plumbers and a fresh crew from the same church rolled in Wednesday night and they plan to have the shingles on tomorrow. Several folks planning mission trips to Lakeshore in the next few weeks have contacted us with concerns about the cooking and eating situation in light of our destroyed camp dining hall. I wanted to give a brief update. We have put together a scaled down working kitchen while we work to establish the fuller facilities. The stick built portion of the kitchen, recently being used as storage, remained intact. We’ve brought in a residential 4 burner stovetop with an oven and a refrigerator. It also has a sink and enough outlets for crock-pots or other things. Some of you may remember, this structure served as our first cooking and eating area. The set up now resembles those early days in the months following Katrina. 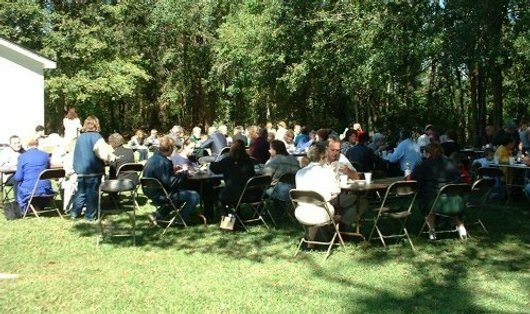 While it may be difficult to feed 200 from here, smaller groups will have no problem. We have room to put a table inside and we also set up a couple of awnings on the slab. For the past three years we have learned to make do with limited resources, slight inconveniences, and less than ideal circumstances. This set-back does not present an insurmountable obstacle, but I wanted to let the cooks know what to expect in the next few weeks. Rest assured we do have a place to cook and eat. I’ll update you as we make progress. We have some things in the works. Photographer Skip Baumhower has been to Lakeshore a few times and has been documenting the recovery efforts of our community. He traveled down this past Tuesday and came away with some incredible pictures. He interviewed some of our great volunteers from Decatur Baptist Church and created a documentary slideshow that you have to see. Following the first presentation, another one will load with images from his previous trips. You will want to share this link with others.